These compact, high-quality testers provide pH calibrations at 4.01, 7.00, and 10.00, as well as temperature in Celsius. 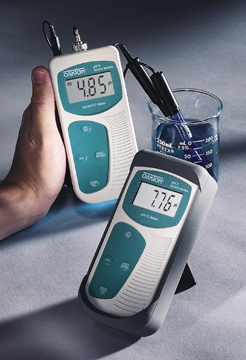 The pH/mV/°C meter can also measure ORP with an ORP probe, available separately. Also featuring ATC, automatic buffer recognition, hold, and auto off, they can be used with most pH and ORP electrodes with BNC connectors. The units come with BNC connectors and protective rubber holders. Each includes both a temperature and pH/mV probe as well. pH range: pH 0.00–14.00 with an accuracy of pH ±0.01 and a resolution of pH 0.01; temperature range: 0–100°C with an accuracy of ±0.5°C and a resolution of 0.1°C; mV range (pH/mV/°C meter only): -1,000 to +1,000 mV with an accuracy of ±2 mV and a resolution of 1 mV. Size: 5 1/2"L x 2 3/4"W x 1 1/4"H. Four AAA batteries, required, are included. pH Range: 0.00 - 14.00pH. Resolution: 0.01pH. Accuracy: ± 0.01pH. Conductivity Range: -1000 to 1000mV. Resolution: 1mV. Accuracy: ±2mV. Temperature Range: 0 - 100°C. Resolution: 0.1°C. Accuracy: ±0.5°C.